Hi everyone, how's everything going? I know it's late but happy new year! We've really busy getting together a number of things from our very own tote bags to content for new post and a lot more things we'll love to share as they transpire. In this post we'll be looking at jumpsuits which I think is an iconic attire. Jumpsuits are an item that has been numerously reinvented. In an attempt to breathe new life into them diverse materials, colors, fittings and occasions are kept in mind for the designs of jumpsuits. These designs take into consideration a lot of looks ranging from casual, runways, event and work appropriate attire. 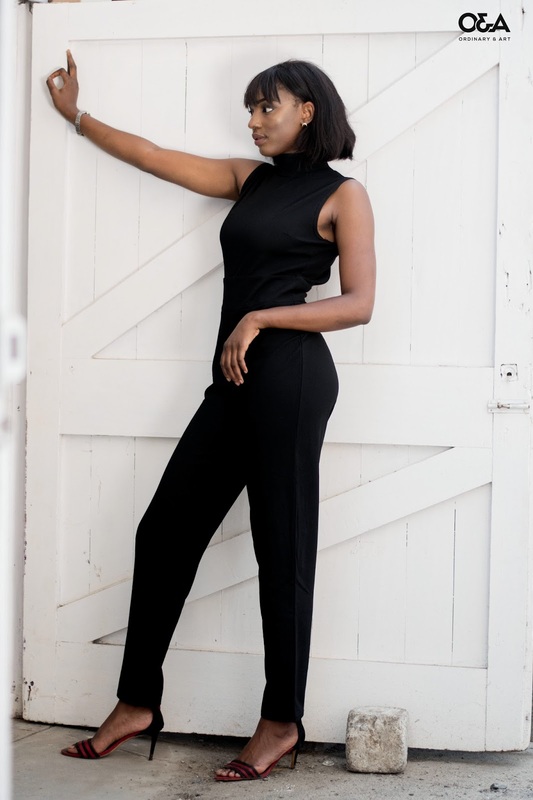 I personally love how you can attain a very elegant looking outfits with minimal accessories and a simple jumpsuit, which was one of the major intentions of this shoot. Also, the jumpsuit fitting to accentuate the models beautiful figure. The black turtleneck jumpsuit looks haute, while the patterned jumpsuit isn't short of stylish it shows off her anatomy, the belt especially helps show her waist and curves. What do you think about this outfit and how would you have liked to style a jumpsuit?